Anonymous portrait of Ferdinand and Isabella: c. 1469. Believed to be their wedding picture and probably a reasonable likeness. The Catholic Monarchs: Ferdinand and Isabella. • both had numerous enemies, and in Castile political conditions were chaotic, with powerful nobles determined to retain their influence. Nevertheless, Isabella succeeded to the throne of Castile in 1474 and Ferdinand to that of Aragón in 1479. Together, Ferdinand and Isabella laid the foundations of Spain’s Golden Age (Siglo de Oro), a period during which it became the largest empire the world had ever seen. • although both monarchs worked closely together in running the country, the interests of the Crown of Aragón were subordinated to those of Castile. In fact, of the 37 years that Ferdinand ruled, he spent less that 4 in Catalonia, even less in Aragón and 6 months in Valencia. • the term “Golden Age” tends to view Spain’s achievements during this period through Castilian eyes (Catalans nowadays, for example, have a different view of the period). 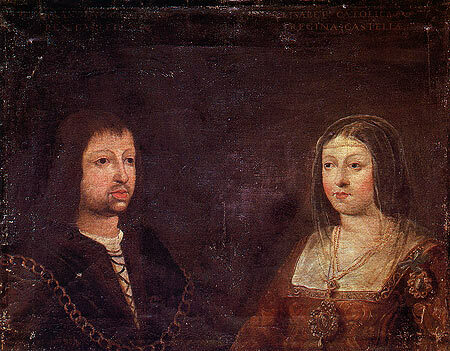 Ferdinand and Isabella shared similar goals when they took power. • the conquest of the kingdom of Granada (the last Muslim enclave in the peninsula), and religious uniformity. That these national goals were achieved says much for the organisational skills, astuteness and maturity of Ferdinand and Isabella**. **Ferdinand’s political acumen, deviousness and strength of character were generously praised in Machiavelli’s Prince (1513). Isabella’s commanding personality is frequently portrayed as responsible for the creation of the modern all powerful role of the Queen in chess. For the general public, the best known of these goals is the conquest of Granada in 1492, followed by the expulsion of those Jews and Muslims who refused to convert to Christianity. An added bonus to the fame of the Reyes Católicos (Catholic Monarchs, a title conferred on Ferdinand and Isabella by the Pope Alexander VI in 1494) was the achievement of Christopher Columbus, a Genoese sailor who set out from the south of Spain for India and found America, or Las Indias as they called it. Perhaps less generally known is that it was during the reign of the Catholic Monarchs that the Spanish Inquisition became a feared social scourge. Long dormant in Aragón, it was introduced into Castile in 1478 at the request of Ferdinand and Isabella to investigate the religious orthodoxy of Conversos (Jewish converts to Christianity). However, since it fell under the direct control of the Crown, it became a political as well as religious tool, and was to have a profound effect on Spanish society for centuries. An unfortunate sequence of deaths, however, had unforeseen consequences. Juan died without issue in 1497, and then the deaths of both Isabel of Portugal and her infant son soon after meant that the right of succession to the Spanish throne passed to another daughter of Ferdinand and Isabella: Juana, who –as it happens– had married Maximilian’s son, the Archduke Philip/ Felipe and was living in Flanders. 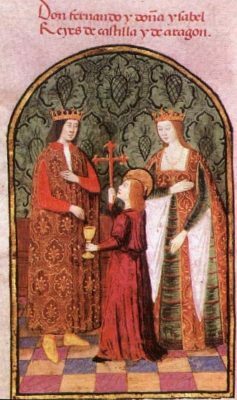 Juana eventually succeeded to the throne of Castile upon the death of Isabella in 1504, but her father, Ferdinand, remained king of Aragón. Fortune didn’t favour either Juana or Philip. Philip died suddenly in September 1506 when he’d hardly stepped on Spanish soil, and Juana –whose mental health was delicate–was soon confined to the isolated castle of Tordesillas. Since their son and heir, Carlos/Charles, was only 6 and living in Flanders, Ferdinand remained as regent of Castile (and King of Aragón) for 10 years, until his death in 1516. Charles’s arrival in Spain in the following year as King of both Castile and Aragón marks the beginning of the Hapsburg dynasty in Spain.